Follow up on some boneheads!!! Follow up on the boneheads I posted a few weeks ago, getting pumped!!!! Big guy still looking good!! Got him back from the taxidermy today!!! Very pleased with him!! Finally got him!!! 19.5' inside spread!! Been hunting him since bow season! 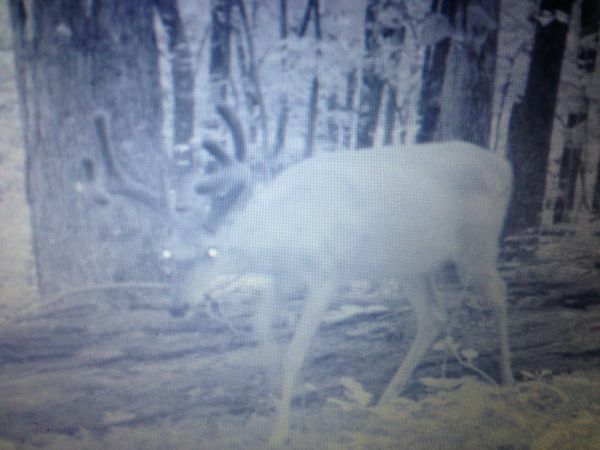 Some more pics of the big 8 i shot right up under 2 weeks ago, glad he has showed back up. I am guessing he is at least 4.5 years old, what do yall guys think? Man I am a sick lil puppy!! Hunted a new stand saturday morning, at around 8am i had a decent 8 pointer come in around 40 yards from me on an acorn flat below my stand. 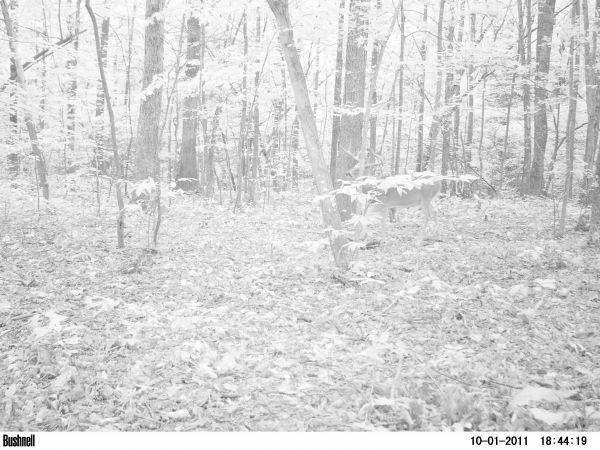 well i have a lucky buck stump in that spot with a cam on it. he didnt come close to it, just feeding on acorns. i told my dad i was gonna take a cam back in there to put on the acorn flat, an see if its worth moving my stand on down farther. 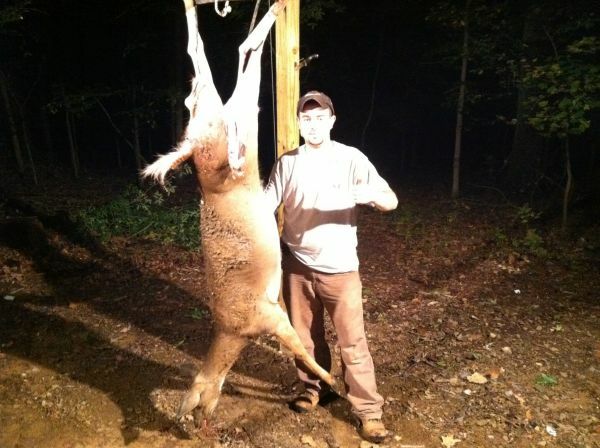 eased into my stand around 230 an hung the cam, eased back up an sat for a while. Around 6pm i saw this big brusier show up! he keep feeding on acorns for around an hr, about 70 yard out. 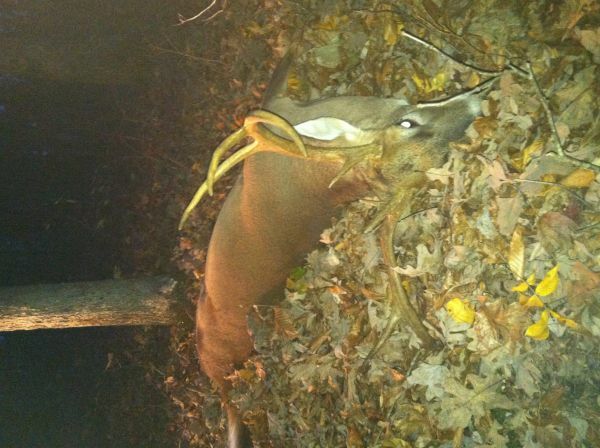 then the 8 pointer i saw that morning came in an the big buck ran him plum out of the hollow. well i lost sight of the big buck, an the wind was blowing 25mph and i couldnt hear a thing. i caught something out of the corner of my eye and this brusier was cutting across the ridge at 45yds, i had a clearing to where i just hung that cam earlier, when he hit the clearing i was at full draw, quartering away, and let the arrow fly. 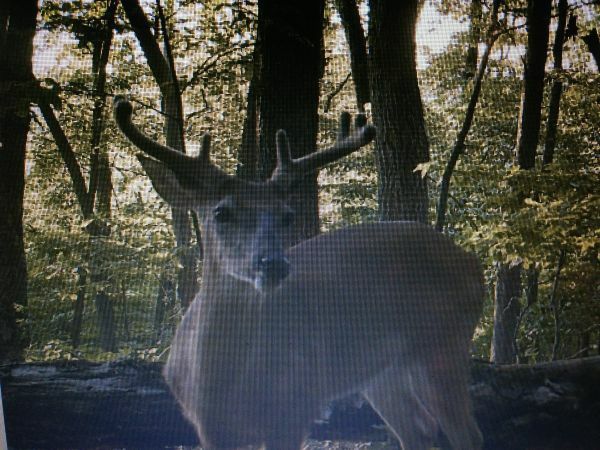 My luck the arrow went right under him, an this is the pic off my cam right before the shot!!! Man i was sick and still sick, guess its called buck fever!!!! hope he returns, thought i would share with yall guys! 1st deer of the year, old horse head doe as GT would say, she weighed in at 122lbs, this time of year thats a pretty good doe in my book, thank God i finally broke the ice!!! 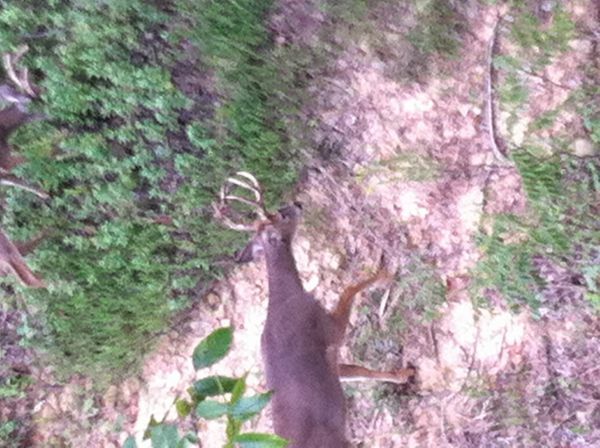 Sorry the pic is alil blurry, took this pic with my phone from the stand, zoomed in as much as i could. This deer will make a pretty buck next year or two, came right under the stand. 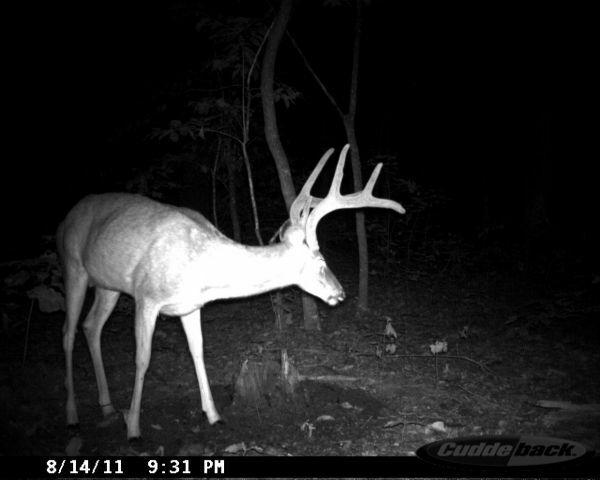 Still has alil velvet hanging off on the left antler. Shooter still returning to the minerals, just after dark. Hope he shows his face this year! 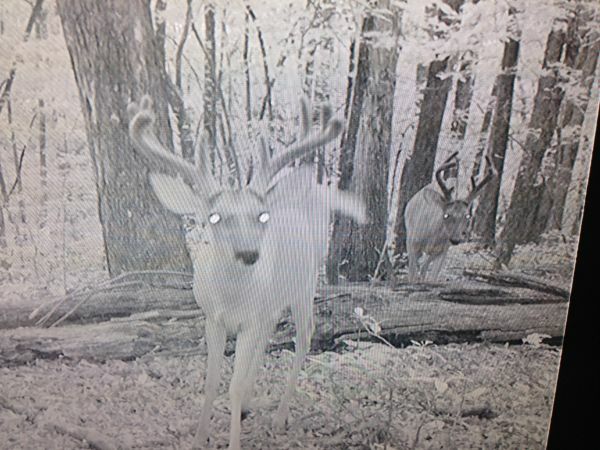 How old do yall guys think this deer is? 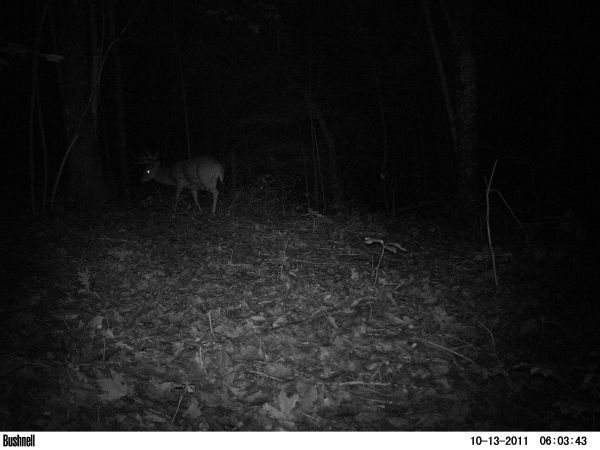 Also guys, Ive been watching this deer this year with his growing process, minus the brow tine, what do yall guys think about him so far? 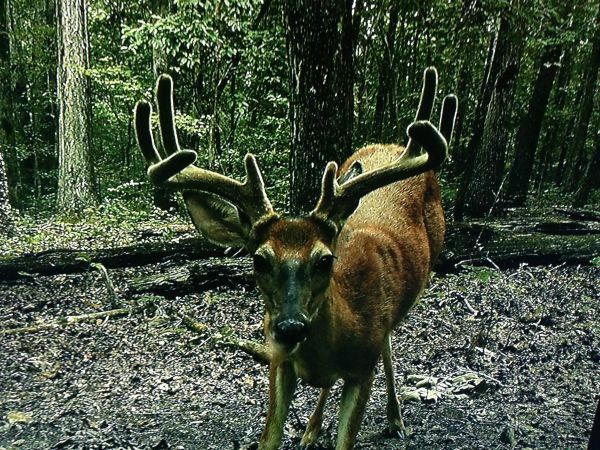 Whatcha think bout this buck? 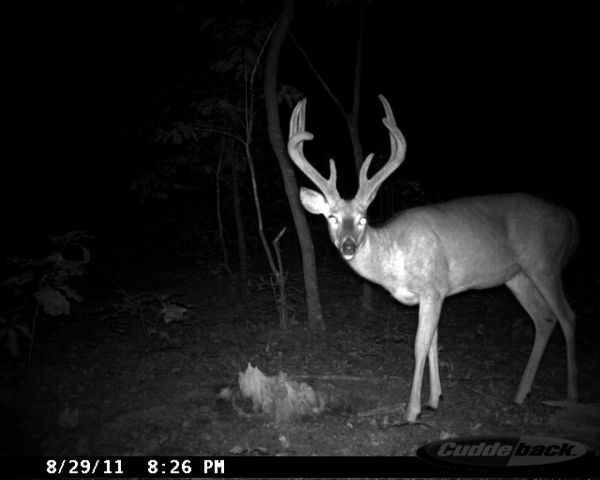 Hey guys, what yall think about this buck, got alot of growing to do, but I'm liking the brow tines. Hitting the lucky buck pretty good. Ready to see the full development. Another successful coyote hunt this morning. 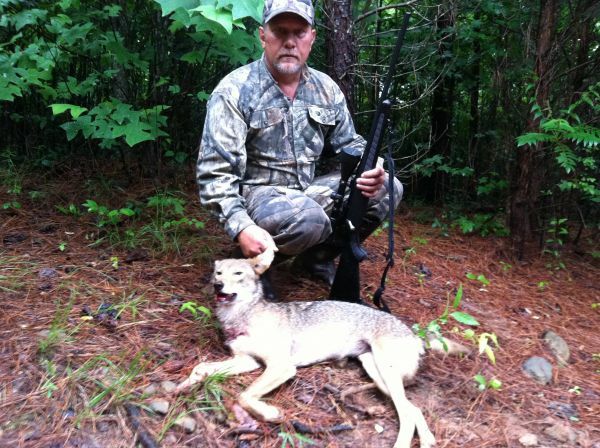 My dad an me went back to the farm this morning to try to take a few yotes out of the woods. Our first set up was in a box blind, with a field surrounded by cutovers. Gave the first call and nothing happened. We got out of the stand an heard the yotes howling up the hill in the cutover about 300yds. So we headed up the road bed to cut the distance in half, got to a spot in the road bed that we could see up the hill. Placed the call out, an got set up. Gave the first call of a coyote pup in distress, and hear they came running down the road. Dad said im gonna take him, and boom. She hit the ground, the big male cut off into the cutover, leading us with no 2nd shot. Another good female off the property!!! 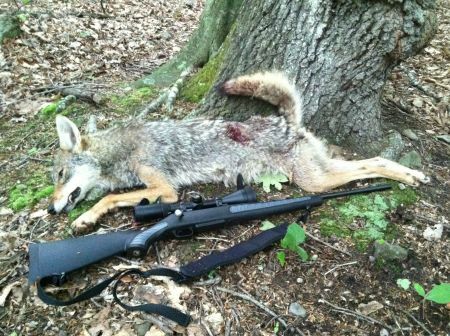 Now that turkey season is out, i figured i would do alil coyote hunting. As i was walking up the road bed to set up on some coyotes, i heard a turkey just a gobbling up on the ridge where i killed the bird on opening day. I said to my self, just why couldnt turkey season still be in. Well i laughed and headed to get set up to call some coyotes. After calling a few rounds, nothing happened, so i grabbed the call and headed to another set up. I got to where i was going to set up, placed the call out, put my face net on, an hit the call of a distressed coyote pup. Boy i heard the woods light up, and could hear them running down towards my way, they closed the distance quick. Came right to the call, i put the scope up on one an boom, she hit the ground, i bolted another shell, an tried to get on the big male. I missed him as he was running for his life. But the female wasnt as lucky. Great exciting hunt for me! Thanks guys an girls! 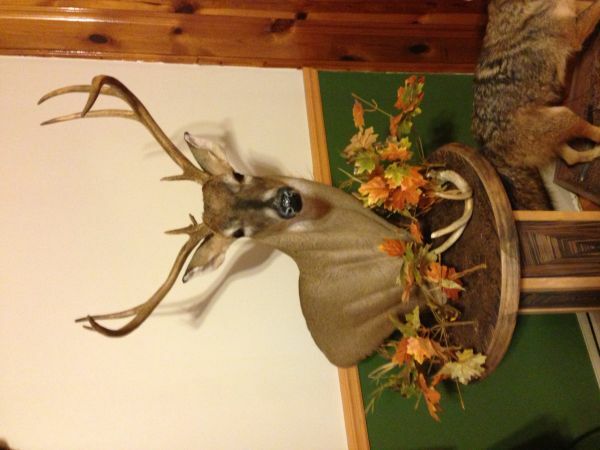 I am really satisfied by the work of my taxidermist, his name is Harold Riggins out of martinsville, VA. He is also the one who is mounting donions deer, which he will also post later this week! Thanks again for the respectful comments!! Thanks guys!! That's my widest buck to date. 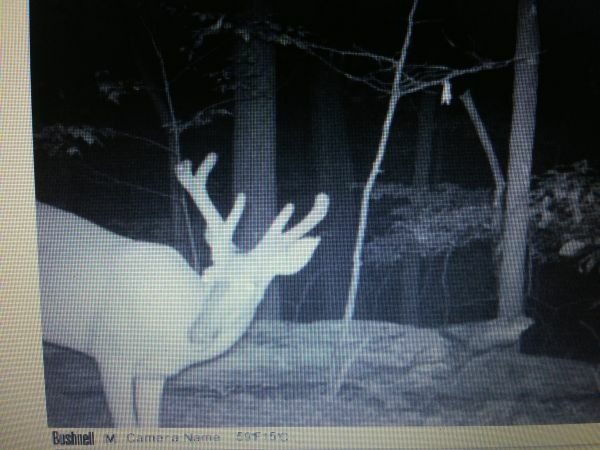 I've had trail cam pics since may of this buck an really wanted him. The buck bomb seemed to be his fatal attraction!! Wow! No comments, lmfao, I'll ask my self how old he is next time, ask for opinions an get none, that's cool, y'all have fun!! I was hunting on an edge of a cut-over, he was just passing by grazing on vegetation. sorry the pic is sideways, thats the way my phone up loaded the pic, you can see the other lil buck alil bit in the pic also. Hey bud, I think that would be a hard deer to pass up, good deer with a bow or gun if ya ask me. Hope you get the chance to see him in person to make that call! A comment titled: Pic in response to a report titled: PLEASE Correct me IF I'm wrong!!! A comment titled: WRONG STATE in response to a report titled: PLEASE Correct me IF I'm wrong!!! 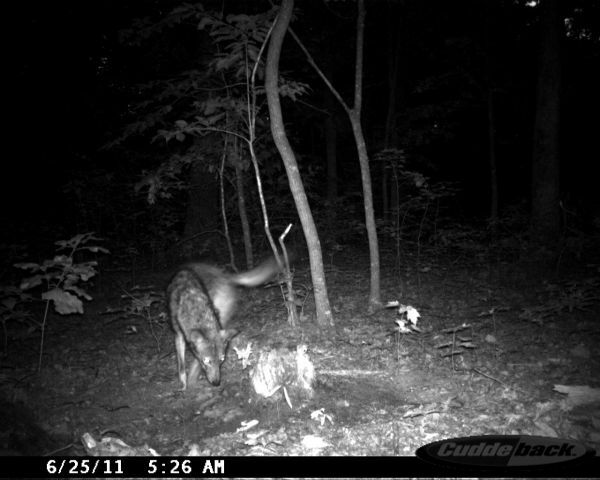 Hey Rockhunter is these the pics you was referring to, i also visit cuddebacks wedsite alot and saw these pics posted last year as a western state?? A comment titled: Buck in response to a report titled: Shooter? Thanks guys for the comments, another ? 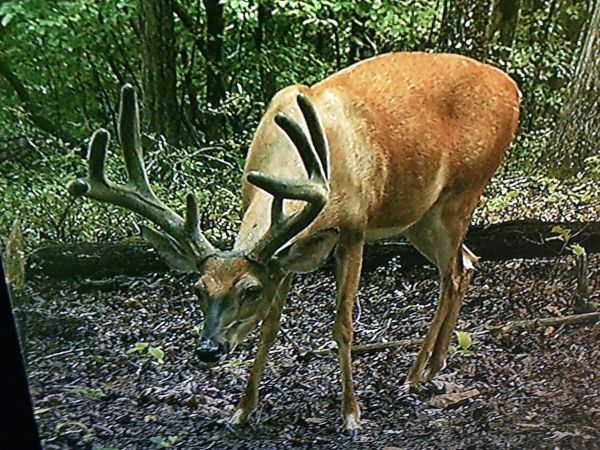 I got is how old do y'all think think this guy is, he looks like a very mature deer, maybe 4 1/2 is what I was thinking, GT... I've been doing pretty good, hope you have to, yes I still do stuff for cane creek calls, an you know all calls are different, I personally like the cane creek custom glass with the cotton mouth striker, u personally might like something else, I dunno. I think with you, personally you will like either one an will call an old Tom up with either one! 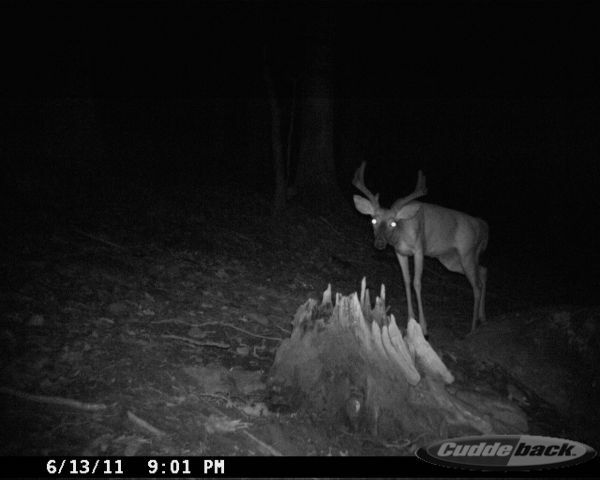 A comment titled: Buck in response to a report titled: Whatcha think bout this buck? Thanks guys, thats the first time on cam this year for this guy. 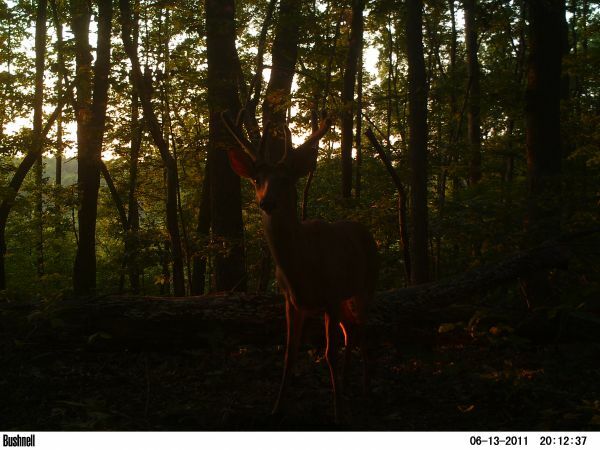 Hope he continues to come visit the lucky buck sites. Thanks for the feed back guys, hope to have new pics in 2 or 3 weeks. Maybe can tell more from him! Thanks alot GT. I'm glad I was able to harvest that gobbler. 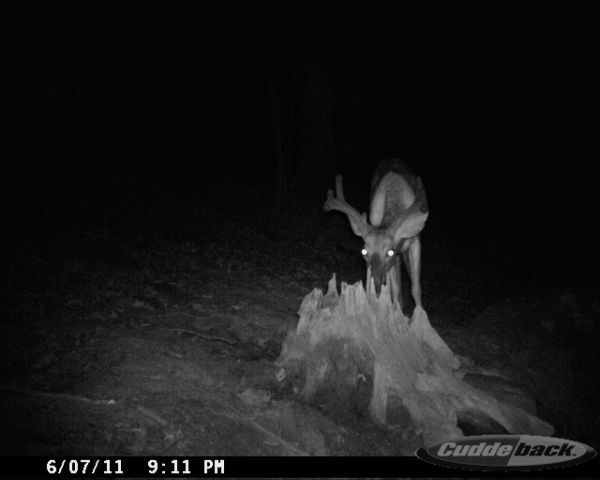 Yes, this is the same stump as last year, I've had this lucky buck site for 4 years now. When I first started the site, the stump was barely above the ground, an was like a cup in the middle that holds water. I added about half of a 20lb bucket to it to get it started, an when they found it, they kept coming back for more. I try to refreshing the stump every 3 weeks in the spring an summer, an once every month in the fall. Try it out, I believe you will enjoy it. I'll try to post more pics in the up coming weeks. I hope others start posting more also, keeps the blood pumping. Good luck to ya in the future, talk to ya later! Hey Viper, I've got lucky buck minerals in the stump. I've never tried the trophy rock yet, they seem to be using the lucky buck so much I kinda don't wanna change it up on them, lol. I have thought about trying a trophy rock on an edge of a field where we have a box blind. Thanks, I'm gonna try to get back out there this weekend also. See if I can't take a few more out during the off season. You could tell that she has had pups this year, wasn't alot of milk left in her bags, but you could tell she had been nursing. Thanks alot Jeff, an thanks for all the people that voted for me during this contest. I'm hoping to be posting alot more pics on this site for many more years. I love to get on this site an browse other peoples pics, comments, an questions. 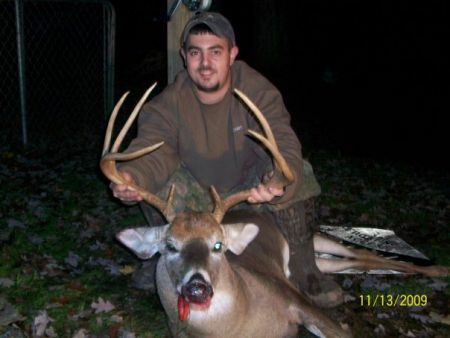 This site is very helpful for not only new hunters but also veteran hunters. Thanks again to everyone!! PS, when I found out I won the contest, I invited my family over for a good ole crock pot turkey dinner! !